And just like that, another year is coming to an end. This year was definitely one of my most creative, as I tried to think out of the box to bring you guys the most incredible recipes that I could dream up. Whether it was all the appetizers or the boozy drinks or the endless list of cookie recipes, I had such a blast working on each and every recipe that I posted this year – even the flops that never made it to the blog! 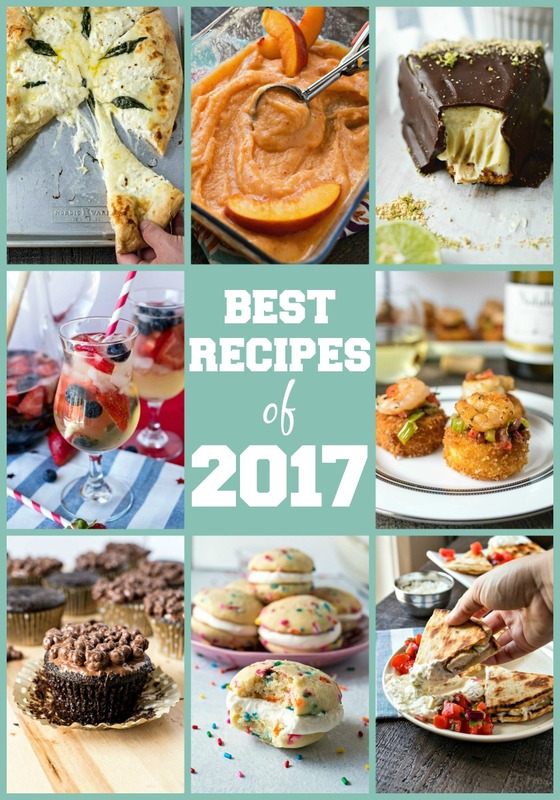 Before the new year comes, I want to spend some time reminiscing on some of the best recipes that I posted this year, most of them voted on by you! So, without further ado, let’s get started! I posted many drink recipes this year. But it was this summertime sangria that won you all over. How can you turn down a killer drink that is perfect for all the patriotic holidays?! My favorite thing about this recipe was how incredible the white wine tasted in this sangria. I am usually a red sangria drinker. But who knew adding a little brandy would make me change my mind?! And just like that, this red, white, and blue sangria became a favorite of mine to drink all summer long. Heck, anytime I had leftover berries and a bottle of white wine lying around, I was making this sangria! Was it the easy wine pairing tips? Or maybe it was the fact that this recipe took a comfort food from the South and turned it into a killer appetizer? Whatever the reason was, you guys went crazy for this recipe! Did you guys like the wine pairing posts? Are there any other wines you want to learn about in 2018? You guys loved these cookies! And, I must say, I did too. It’s that subtle hint of almond extract that won me over. But I’ve sure it was the fun sprinkles and creamy icing that you guys loved the most. When I first tried chocolate-covered key lime pie in the Florida Keys, I knew it was something special. So when brainstorming ideas for summer recipes, my own interpretation of the dessert was at the top of my list. Well, it turns out you guys went crazy for it, especially on Instagram. This post got me the most likes of any photo that I’ve ever posted – nearly 400! It may not be a lot in the Instastars realm, but it was huuuuuge for me. This recipe is one of my favorites, for sure. But I had no idea you guys would go so crazy for it! It just shows you how powerful a cheese pull can be. Within days of posting this recipe, it blew up on Pinterest and hasn’t slowed down since. Even during the holidays, when my sweet treats dominate, this pizza was still in the top 5 each day. This recipe was inspired by our many trips to Zoe’s Kitchen. Have you heard of it? It’s a fast-casual spot that serves Greek-inspired dishes. I loved all the fresh veggies and rich flavors in all their food. So I decided to make my own inspired Greek dish. And so the Greek Chicken Quesadillas were born. It was my first time making tzatziki sauce, as well, which is now my favorite sauce of all time. I call this my most surprising recipe because I didn’t expect to love it. See, I am not a huge fan of chocolate cake and Nutella doesn’t make my mouth water like it does for most people. I know, two shocking revelations in one sentence. Despite my iffiness of these flavors, I thought you guys would love it. So I intended for this recipe to be one just for you guys; one that was super chocolatey and rich and easy to make. But as soon as I took one bite, my life changed forever. The crunch of the crispy bites on top, paired with the nutty Nutella, and the ultra-moist cupcakes were so incredible that I was eating these days later! I never thought I’d love a chocolate cupcake this much. But it just goes to show you…even my tastebuds can be won over by an incredible recipe. I thought picking a favorite would be hard. But as soon as I remembered this sorbet, I knew it was the one. This peach Riesling sorbet was the creamiest sorbet I’d ever made and the pairing of the peach and Riesling was simply heavenly. I ate this sorbet all the time and savored every bite. Gosh, just thinking about it is making be want to make this again right now. Alright – that’s it for 2017! Which recipe was YOUR favorite? Make sure to let me know in the comments below. Let’s hope 2018 is full of just as much great food. What kinds of recipes do you want to see in the New Year? Curious about last year’s list? You can check it out here! I need to make those Funfetti Whoopi Pies ASAP! They look delish! yesss girl! You should try them out for VDay – just use red, white, and pink jimmies! These recipes look absolutely amazing! I could eat all of them right now, even after over-indulging at Christmas! Pizza is definitely my thing so your most popular recipe would be my favourite! Oh man you’re gonna love that Pizza Bianca! So incredibly yummy! I can’t decide which recipe to make first! Happy New Year! Can I say they are all my favourtites? Like I CAN NOT EVEN choose my favourite! They look sooooooo good! Haha that’s a great problem to have! That red white and blue sangria looks soooo yummy! Thanks so much! Def one of my faves!